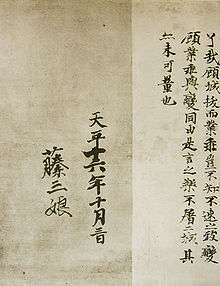 An example of Empress Kōmyō's calligraphy　and her autograph signature -- Gakki-ron (c. 756). Empress Kōmyō (光明皇后, Kōmyō-kōgō) (701–760) was the Nara period consort of Japanese Emperor Shōmu (701–756). A member of the Fujiwara clan, her father was Fujiwara no Fuhito and her mother was Agata Inukai no Michiyo (県犬養三千代). During her life she was also known as Asukabehime 安宿媛, Kōmyōshi (光明子), and Tōsanjō 藤三娘. She is buried in Nara Prefecture's Hōrenji-cho in the mausoleum Sahoyama no Higashi no Misasagi 佐保山東陵 near Emperor Shōmu in the southern mausoleum. She married Emperor Shōmu at the age of 16, and gave birth to the princess Abe at the age of 18. She gave birth to her first son at the age of 27. Unfortunately, he died soon after birth. The Fujiwara clan insisted that Prince Nagaya had killed the prince by the curse. She became an empress at the age of 29; and she was the first to be raised to the rank of kogo in historical times. A ritsuryo office was created for the empress-consort, the Kogogushiki; and this bureaucratic innovation continued into the Heian period. Tenpyō 20 (749): After a 25-year reign, Emperor Shōmu abdicated in favor of his daughter, Princess Takano, who would become Empress Kōken. Some time later, Shōmu took the tonsure, thus becoming the first retired emperor to become a Buddhist priest. Empress Kōmyō, following her husband’s example, also took holy vows in becoming a Buddhist nun. Artifacts connected with Kōmyō and Shōmu are among the treasures housed at the Shōsōin. Four of her poems are included in the Man'yōshū imperial anthology. As a devout adherent of Buddhism, Kōmyō encouraged the construction and enrichment of various temples, including Shinyakushi-ji (Nara), Hokke-ji (Nara), Kōfuku-ji (Nara), and Tōdai-ji (Nara). Kōmyōike Station in southern Osaka Prefecture takes its name from a nearby artificial lake named after Empress Kōmyō. This toponym comes from a supposed association with the empress's birthplace in the province of Izumi. Emperor Shōmu's officially designated Imperial misasagi or tomb can be visited today in Hōrenji-cho, Nara City. The Imperial tomb of Shōmu's consort, Empress Kōmyō, is located nearby. 1 2 Ponsonby-Fane, Richard. (1959). The Imperial House of Japan, pp. 57-58. ↑ Brown, Delmer. (1979). Gukanshō, p. 274. ↑ Piggott, Joan R. (1997). The Emergence of Japanese Kingship, p. 308. 1 2 3 Varley, p. 143.